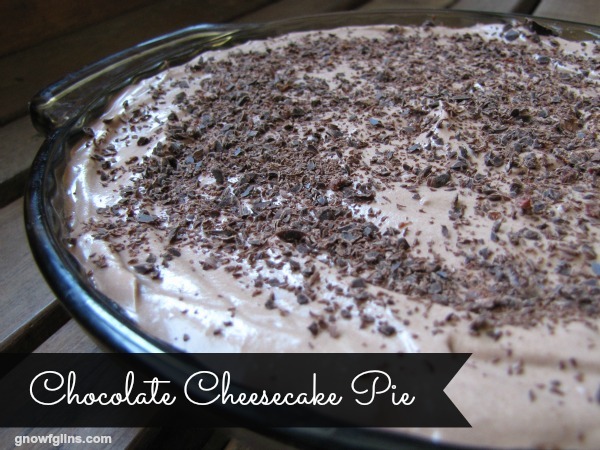 This scrumptious chocolate cheesecake pie graced our Thanksgiving table. My daughter based it off this raw cheesecake pie but reduced the sweetener, made it chocolate, and used a different crust. Heavenly! We just know you will love this. Make the crust and freeze for 15 minutes. Whip the whipping cream in a stand mixer or blender until light and fluffy. Transfer the whipped cream to its own bowl. Mix the cream cheese, honey, cocoa powder, and vanilla in the stand mixer or blender until smooth. Taste for sweetness and adjust if necessary. Fold the whipping cream into the cream cheese mixture until well mixed. Pour cream cheese mixture over the crust, splitting evenly between the two pies. Sprinkle with dark chocolate shavings (if using). Freeze for several hours, minimum. Take out and let thaw for 15 to 20 minutes before cutting and serving. Merry Christmas! I hope you are able to fit this pie into your festivities sometime soon! What is your favorite flavor of cheesecake? Need help with allergy-free cooking? Learn the ins and outs of nourishing allergy-free cooking in our online class. This post was featured in 57 Scrumptious Egg-Free Desserts and 51 Cold Summer Desserts. Is whippING cream heavy cream or whipped cream? Sorry to ask such a basic question…I’m sure it’s very common, I’m just not much of a cook or baker! I have never had any type of chocolate cheesecake before. It looks absolutely amazing. I will have to look into nut crust’s. Ive been looking for a good gluten free crust for awhile now. My 12 year old daughter and I made this to take along to our family Easter dinner. We used a gf graham cracker crust. We loved it. I would say that my non-traditional eating family were not as smitten but we really did make it for us as we knew any other options available would be full of sugar and gluten (and we were right). My little family really enjoyed it. I did use store bought cream cheese but would love to try this with some homemade cheese in the future.